Keep this to yourselves but I have a secret. My secret is called 'Jack,' for reasons still unknown to me, and I call him my 'lucky charm.' Jack is a rather splendid if somewhat quirky individual. Larger than life in nature, with strong, refined features, you will either love him or hate him upon your first meeting. But Jack is no ordinary fellow by any means. Oh no! 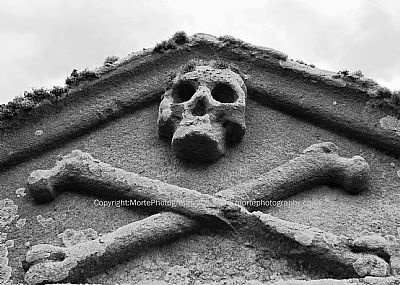 He is, in fact, the largest skull and crossbones you are probably likely to stumble across in a Scottish graveyard. 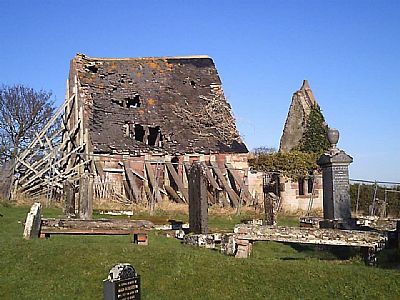 "Not long ago I wrought for about a week in the burying-ground of Kirk-Michael, a ruinous chapel in the eastern extremity of the parish of Resolis, distant about six miles from the town of Cromarty. It is a pleasant solitary spot, lying on the sweep of a gentle declivity. The sea flows to within a few yards of the lower wall; but the beach is so level, and so little exposed to the winds, that even in the time of tempest there is heard within its precincts only a faint rippling murmur, scarcely loud enough to awaken the echoes of the ruin. Ocean seems to muffle his waves in approaching this field of the dead. A row of elms springs out of the fence, and half encircles the building in the centre. 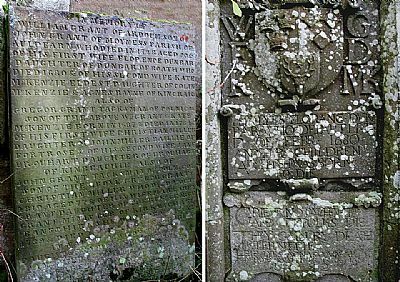 Standing beside the mouldering walls, the foreground of the scene appears thickly sprinkled over with graves and tablets; and we see the green moss creeping round the rude sculptures of a primitive age, imparting rightness and beauty to that on which the chisel had bestowed a very opposite character. The flake-like leaves and gnarled trunks of the elms fill up what a painter would term the midground of the picture; and seen from between the boughs, the Bay of Cromarty, shut in by the Sutors so as to present the appearance of a huge lake, and the town beyond half enveloped in blue smoke —the windows sparkling through the cloud like spangles on a belt of azure—occupy the distance. The western gable of the ruin is still entire, though the very foundations of part of the walls can no longer be traced on the sward, and it is topped by a belfry of hewn stone, in which the dead bell is still suspended. From the spires and balls with which the cornice is surmounted, the moss and lichens which bristle over the mouldings, and the stalks of ragweed which shoot out here and there from between the joints, the belfry, though designed in a barbarous style of architecture, is rich in the true picturesque." But it is Jack that rather steals the show. To be honest you can't really miss him. As you enter the churchyard he is the first thing that catches your eye, sitting proudly upon the pinnacle of a now forlorn mausoleum. This particular structure was built in the seventeenth century by William Grant of Ardoch, for his first wife Florence Dunbar, and is constructed from a series of stunning pink sandstone blocks, measuring 3.85m in length, 2.47m high, together with exquisite stone balusters. The entranceway is capped by a pyramid shaped lintel, 1.34m in length, 0.45m high, where Jack can be seen in all his glory. 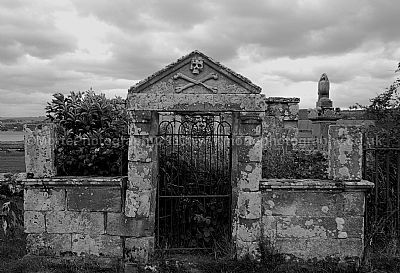 On the back wall of the mausoleum is mounted a grey schist plaque complete with the Dunbar family crest, carved with a totemic stags head in the centre. Animal images such as stags and boars are popular heraldic emblems and have been found on other grave markers within the parish area, possibly a throwback to the previous Pictish age. The good news is that this rare beauty of a mausoleum will be restored back to its former glory in the not-too-distant future, together with the church ruins, so I promise I will post images of its so-called 'resurrection.' Although I am somewhat concerned as to the effect this will have on Jack. With all this new attention will he find a new love, a new adoration and simply toss me to the curb? I recoil at the mere thought of it. After all Jack is mine, my precious. Did I mention that? Comment from Mike Hunter at 15:47 on 13 June 2016. Comment from Mark Roberts at 13:34 on 19 June 2016.